Being a caregiver can be rewarding but challenging. Technology offers tools to find support, information, applications, facilities, and other resources to help caregivers make the journey less isolating. She throws a ball in the air. It lands softly in her right hand as her fingers close around it in a grip. Another gets thrown, just above eye level, then comfortably and securely falls into the left. "Nothing to it," she whispers to herself, throwing two more into the air. Only this time, the balls fly into the sky, forcing her arms out and pushing her balance off kilter. As she stretches her limbs she silently hopes to catch the balls and her composure alike. But, alas, they fall to the ground—and her eyelids drop in shame. She looks up hearing only silence among the crowd, dreading bitterly it might turn to laughter. "But there's more to go," she urges, nervously scrambling to collect herself. She trades in her solace for tension, her confidence for doubt, not knowing how or when this balancing act will end. The story above is not of a juggler but a caregiver. The balls she throws in the air describe the multitude of tasks she manages on a daily basis between caring for her loved ones and herself. The audience symbolizes society around her that watches as she goes on, act after act, hoping to find a bit of whimsy behind the daily routine. Expectations are high, resources are low, and often there aren't many helping hands. But for this woman, the show must go on. Caregiving is her priority, her duty, minus the glamor and applause. To simply define a caregiver as someone who gives care would be a gross understatement. A caregiver is an individual who typically provides emotional and financial assistance, organization, coordination, time, physical labor, and in many cases, love. Rajiv Mehta, MBA, MS consultant at Bhageera, Inc., in Mountain View, CA, finds that on a daily basis, most of the work done by a caregiver is a never-ending stream of small tasks that can vary tremendously. These range from checking in on someone, doing chores around the house, and helping move someone from bed to chair to toilet, to incredibly difficult and time-consuming work such as providing 24-hour support and supervision to a spouse with dementia. Mehta calls this "essentially dealing with life." In an informal study where he asked caregivers to log their daily activities, Mehta found that even a short log had 80 or more entries per day. When looking back on their log, caregivers were often shocked by how much they were doing and forgot that it became so routine. According to Gail Gibson Hunt, president and CEO of National Alliance for Caregiving in Bethesda, MD, "It's important to realize that the average caregiver spends 20 hours a week or more supporting an aging family member or friend by providing assistance with activities of daily living or even medical tasks, all the while balancing their own needs, their jobs, and their families." The amount of time spent performing these tasks can be likened to a part-time job, a significant portion of the week that many caregivers struggle to devote. To make up the difference, caregivers in the workplace sometimes cut down on their hours, pass up promotions, or even exit the workforce to support their loved ones. Mehta found similar statistics in his research, and says the long-term impact of these decisions, from which one can never recover, is enormous. But the struggle doesn't end there. For most caregivers, help is not readily available, or the search for help seems nebulous. Karissa Price-Rico, chief marketing officer of Intel-GE Care Innovations in Roseville, CA, says that "Many caregivers don't seek assistance until they are at the breaking point emotionally or physically." This results from an interesting phenomenon when caregivers avoid self-identifying. Hunt finds that caregivers don't see their role as separate from their role as a spouse, daughter, son, or parent. Rather, they just feel that it is their obligation to step in when needed by a loved one. Richard Adler, MA, MBA, distinguished fellow at the Institute for the Future in Cupertino, CA, finds it striking how this phenomenon causes many caregivers to work in isolation rather than band together to create a support system. Hunt and Adler agree that it creates a huge gap among caregivers who don't know how or where to turn for help. To further complicate matters, there is a stigma that surrounds caregiving that makes individuals feel uncomfortable talking about their situation at work or with friends, Hunt says. Although caregiving is far from taboo, it's just not something most people talk about while getting pulled into all other facets of life. As important as it might be to process the day's events with others, discussing Mom's medication regimen or feeding schedule doesn't make for lively dinner conversation. Mehta believes this impinges on a caregiver's ability to socialize, causing him or her to feel "trapped." When caregivers can't turn to their own support networks, some become heavily reliant upon specialized groups, area agencies on aging, and local nonprofits that can offer assistance within the disease community. While these programs provide great services, their reach is limited. "The National Family Caregiver Support Program serves an estimated 700,000 family caregivers each year, but with 65 million family caregivers in the United States, the demand for services vastly outstrips the supply of services and supports," according to Hunt. Experts agree that it's an unfortunate reality for caregivers when they don't realize that help is right at their fingertips. When local resources are unavailable or limited, caregivers should consider a vast array of assistance that can be accessed through Web-based technology. According to Price-Rico, with the rise of social media and the Internet, there are a variety of websites and groups where caregivers can learn more, connect, and share, which proves to be a most valuable tool. Over the years, these tools have grown in sophistication, ease of use, and widespread availability. Price-Rico finds that "Technology makes our lives more efficient while giving us access to a world of information on the go, which traditional pen and paper cannot. It can also connect us with people that we may not have access to in our daily offline lives which can be really beneficial in terms of information, advice, and empathy." • Informational resources: For directories, guides, educational information, webinars, and online tutorials, Web-based technology can help an individual learn about a variety of topics without having to leave home. • Access to resources: For caregivers in search of an adult day center, nursing home, homecare assistance, Meals on Wheels, durable medical supplies, Medicare/Medicaid information, and other resources, the Internet offers extensive and comprehensive information on how and where to access these services. Also helpful are pages that offer reviews written by other caregivers who have utilized them. • Family coordination: This type of technology supports communication; caregivers can help one another share the emotional load and discuss their individual experiences. Caregivers also can get involved in blogging, which can be particularly therapeutic for those who enjoy writing with the added benefit of live feedback. Caregivers build a community and can feel connected to people from across the globe, all from the comfort of their homes or mobile devices. • Task-management apps: Designed for use on tablets and mobile devices, this organizer-type technology "provides an all-inclusive tool set to manage the caregivers' to-dos, goals, medication management, stress management, exercise, and nutrition information, as well as manage the daily vital signs and health of their loved ones that they can then share with a physician," Price-Rico says. • Remote monitoring technologies: This describes an installation system that can be wired in the care recipient's home for remote-access monitoring. According to Adler, this range of technology allows the caregiver to track daily activity for added peace of mind when he or she is away from loved ones. For example, if a caregiver determines that his father's dementia causes him to forget meals, a monitoring device can be attached to the refrigerator door. If the door hasn't been opened at least once per day, the caregiver will receive notification. This can prompt the caregiver to place a reminder call to Dad, or pay him a visit if necessary. Such activity will appear on a dashboard, and can be tracked from any smartphone or mobile device. Using Web-based technologies can afford a caregiver much-valued privacy and confidentiality. Although reaching out to friends, family, and neighbors has been done for millennia, dealing with loved ones can come at a price, Mehta says. While the caregiver might get some help, it comes with strings attached as it can bring forth all sorts of unresolved and unresolvable family dynamics. On the contrary, using Web-based platforms for support offers anonymity and allows caregivers to talk freely about their daily challenges without worrying about stigma or judgment from others, Hunt says. This earns the individual the freedom to really expose thoughts and feelings in a candid, unedited fashion, and be open to receiving help. Web-based technologies can also be a terrific time-saver for caregivers on a particularly tight schedule. Hunt feels that an online training course that a caregiver can take at their convenience may be easier to access than a class that they must attend in person (and perhaps miss work to attend). With remote monitoring technologies, a caregiver can be "on top of" their loved one's schedule, without physically needing to be present. In the long run, these tools will help individuals manage their schedules better by creating time within an already busy day. Despite the significant impact that technology has had on the caregiver experience, it is important to consider its limitations as well. According to Hunt, "Care coordination platforms are in early-stage implementation and many require the caregiver to input a substantial amount of data and end up creating additional work for the caregiver. This is an area where developers should focus on ease of use and research how the technology can meet the need, and not the other way around." Price-Rico speaks to the incentive offered by certain platforms, warning caregivers to know their source and be educated consumers. For example, if someone is looking for information on a commercial site that connects people to resources like elder housing, the caregiver isn't necessarily getting unbiased information or the total story regarding their options. That doesn't mean these sites don't have valuable information or forums to meet other caregivers; it just means that caregivers need to be aware of the incentives involved, she says. Price-Rico advises caregivers to do their research and ask others where they are finding the best help. Mehta finds that despite the extreme usefulness of such platforms, "the vast majority of needs of caregivers are not well met by current technology because the reality is that the needs far exceed the tools that are available to us today." In addition to what's readily available, he suggests taking advantage of basic tools that weren't designed specifically for caregivers but that can be surprisingly helpful with organization, such as Google Docs and three-ring binders. Adler's research has yielded a fairly clear conclusion: "Technology is good but not good enough." As each person's circumstance is unique, generic support found on websites is not tailored to the individual experience. Caregivers still need a human support mechanism, such as a coach—people who would assist the caregivers in finding the technology that would help them and teach them how to use it. The scale of caregiving is quite large and finding a solution is a challenge, Adler says. 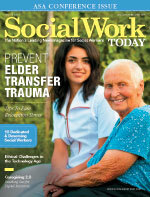 Social workers can impart tremendous value by bridging the gap between caregivers and technology. One method may be leading online support groups and providing referrals to caregivers for resources. Another possibility is to provide simple, accessible information on how to manage the stressors of caregiving, Hunt says. Social workers who are well versed in discharge processes or working with government entities have a wealth of knowledge to share with entrepreneurs and tech companies who seek to create new tools to help lower health care costs, Price-Rico says. She believes the marriage of technology and high-quality services can truly bend the cost curve in health care and, more importantly, create better health outcomes for all involved. Adler finds that it's extremely beneficial when social workers are technologically literate. Although these things aren't "silver bullets," he believes they should be part of the range of solutions social workers can offer. According to Adler, "It's sort of a new role but it makes for user-centered design if a social worker can create a tool or help in creating a tool with his or her target audience." He thinks it behooves the developers to tap social workers' expertise. Further, Mehta believes that social workers tend to be particularly human and observant; they can understand issues in a deep way that inventors may not. Since they are in the homes helping people and paying attention to their needs, they would offer very different insights. It's within the mundane daily routine that social workers are closer to the problems—and the solutions—than inventors typically would be. In a fragmented health system where caregivers are trying to provide care for their loved ones while managing their daily lives, using tricks of the trade can be enormous in saving time and perhaps more importantly, sanity. When social workers join hands with Web-based technology services, they can bring caregivers just a bit closer. — Susan London, LMSW, is a freelance writer and the director of social work for Shore View Nursing and Rehabilitation Center in Brooklyn, NY.